“Gather your partner. Simply move together.” – Takeda-Shihan. View Takeda-Shihan at the 44th All Japan Aikido Embukai, 2006. View Numata-Shihan’s performance demonstration, with katana, jo and a variety of waza. 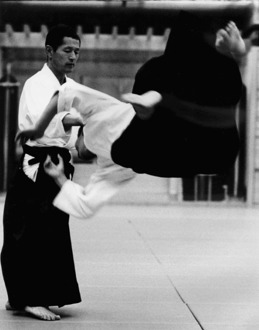 “Aikido is a non-competitive art. It was invented as a way of dealing with attack without counter-attacking. Physically it is very harmonious; mentally it is about extended power and centre; spiritually it is an art of letting go.” – Ralph-Shihan. Our approach is dynamic and aims for effortless motion. This means following, not forcing, your partner. Our emphasis goes beyond performing techniques to exploring motion and to capturing the feeling of aikido. We work together to learn the principles of aikido and to gain a personal understanding of these principles. In this way the art becomes ours and we can become aware of our partner’s movement and how we may move together. Our training environment encourages practising aikido with all sorts of people as the more people we come in to contact with the deeper our research can go. This is why our approach is called the aikido research group (‘aikido kenkukai’). AKI is not a separate style from the Aikikai. AKI is a group of students around the world who follow the approach of Takeda-Shihan, who is on the Aikikai Board of Directors and who was awarded an 8th Dan from the Honbu in Japan in 2006. The spirit of AKI is mirrored in the kakejiku (scroll) given to us by Takeda-Shihan. Rather than the three characters that comprise aikido, it has only two kanji (chinese characters): ‘ai’, meaning harmony, and ‘ki’, meaning spirit. The third character ‘do’ has been deliberately omitted. This is because Takeda-shihan is encouraging us to find our own way, to discover and develop the Art for ourselves. This approach challenges us to learn and play not just with techniques but with the ideas of aikido and with every new partner we can learn, and share, something more. The club was founded in 1994 by Ralph Pettman-Shihan who has been practising aikido for over 45 years. In 2006 he was awarded a 6th Dan from the Aikikai Honbu in Japan (he received his 5th Dan in 1997). Ralph currently lives in Karuizawa, Japan, where he teaches aikido twice a week. When not teaching aikido, Ralph also teaches world politics at Gakushuin University in Tokyo. Mike Lubomudrov, 4th Dan, is the club’s principal instructor and is assisted by Adrian Slack, 2nd Dan, and Craig Williams, 1st Dan.